Include core as a source in addition to plugins and themes. Refactor source comments to only consist of JSON-encoded source data. Include the function name in the source. Add some tests specifically for registered widgets. Try using all action instead of wrapping all callbacks up-front. * Include core as a source in addition to plugins and themes. * Refactor source comments to only consist of JSON-encoded source data. * Include the function name in the source. * Ensure that filters/actions added during execution of page get wrapped. * Prevent hook wrapping from happening on callbacks for functions with parameters passed by reference. * Split widget callback wrapping logic out from hook callback wrapping. Sorry for the delay here. I'll review this late today (Sunday) if that's alright. $GLOBALS['wp_registered_widgets'] = $this->original_wp_registered_widgets; // WPCS: override ok.
Good idea to reset the original global $wp_registered_widgets. It should be something that gets reset for us automatically, but it wasn't so this is to ensure we reset the global state. It's nice how this adds the json-encoded source data to the comment. 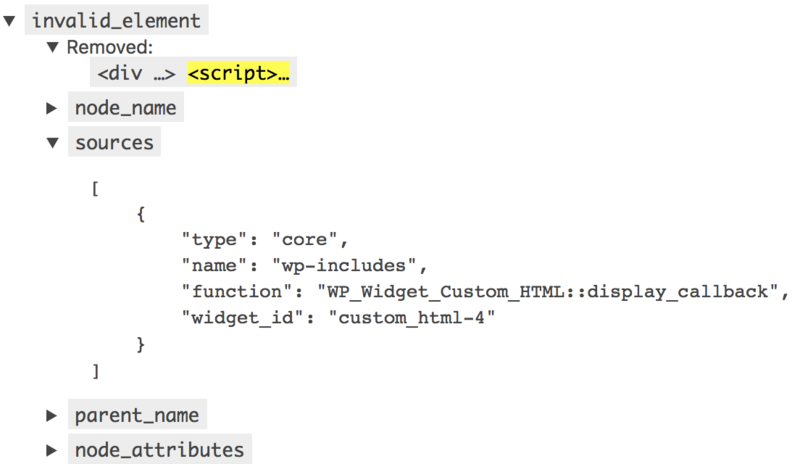 It's nice how this displays the function in the UI, and places the json-encoded sources in the comment.